In nearly every aspect of life, a family connection provides the surest means of establishing a relationship. It can prove handy for helping to get a job interview as well as a hook up that can lead to a romantic relationship. The same could be said when arranging a meeting with a celebrity like the late Stan Lee. That proved all too true when my wife and I were offered the opportunity to spend an afternoon at the home of Stan and his wife Joan Lee. We were in L.A. on a writing assignment for CBS, the company I was working for at the time. It was 2006, and I was there to cover the Grammys for the company’s in-house entertainment magazine. Alisa’s mom told us that Joan was a regular customer in the shop that Alisa’s parents owned in Hewlett, New York. They became good friends, such good friends in fact that they subsequently went into business together, opening a clothing boutique in Fort Lauderdale which they operated until the Lees made their move to L.A.
That was enough to encourage Alisa to pick up the phone and let Joan know that we were in town for a short time and would love to get together. Besides, Alisa had something of a comics connection herself; her uncle, Lou Fine, had been a comic book cartoonist back in the day and had even been responsible for creating his own super heroes—the Flame, Doll Man, Uncle Sam, the Ray, and Black Condor, among them. Had it been necessary, she might have used that knowledge for back-up had the mother-in-law routine not worked out. Fortunately, a back-up reference wasn’t needed. Joan picked right up on the idea of an invite, and with driving directions in hand, we cruised into the Hollywood Hills in search of Stan’s house the next day. The Lee’s lair was relatively modest by most celebrity standards, but it offered a spectacular view of its surroundings, as well as a pool, pool house and an outside veranda that overlooked the nearby hills. An impressive collection of paintings and other fine art adorned practically every room. 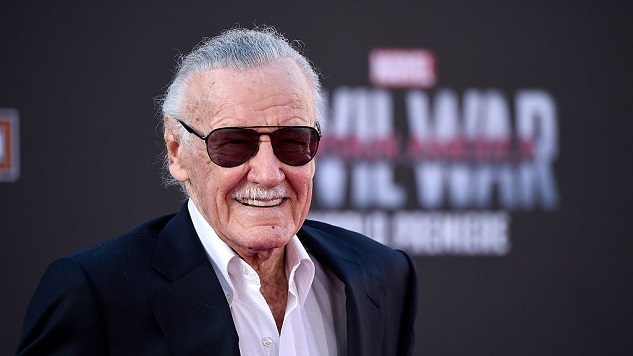 However, the furnishings that attracted my attention were the stand-ups and paintings of the various Marvel comics icons that were displayed prominently in Stan’s study. I remember a life-size replica of Spider-Man in particular and the drawings that pictured Lee side by side with his creations. Joan ushered us in and offered us appetizers and champagne. Stan appeared a short time later, extended his greetings, and then he and Joan gave us a tour, which eventually led us to the veranda. That’s where we settled in and spent most of the day sharing memories that Alisa’s mom had of the Lees. Stan’s only real reference to his superstar stature arose during a mention of Tobey Maguire’s starring role in the first Spider-Man movie. That said, Stan appeared to be a humble man, obviously proud of his accomplishments but not about to flaunt his success or elevate his ego, especially around his house guests. We never felt like we were in the presence of entertainment royalty. It was more like we had known the Lees for years, and we were simply reconnecting with some old family friends. Stan made his own cameo in the strip, pictured as a postal carrier who delivers the post office supplies. He also gave me his email address, and from that day forward until Joan’s passing a few years later, we emailed back and forth. I would reach out to commend him on his film cameos and he would jokingly respond by saying that the paparazzi were tailing him. I always made it a point to lament the fact that the Oscars didn’t have a category for best cameos. Stan got a kick out of that. Just prior to Christmas 2014, I sent him a note telling him that both my mom and my mother-in-law had passed. I also added a reference to a newspaper item I had seen that mentioned he had sold a piece of their property. We’re still at the same address. That was just a piece of property we sold. Condolences for the passing of your mother and Alisa’s mom. What a heartbreaking loss. As for us, busy as hell, but hope the New Year will be all you hope for. Was at a Tennessee Con recently. Great place. All best to you both. The time we spent with the Lees on that sunny afternoon cemented a friendship I still cherish. To me he was more than simply a comics genius. He was the wonderful host who welcomed us into his home, sharing an afternoon Alisa and I will remember forever.